Trust us to take care of all your fret work requirements! At Guitarlodge we are experienced in all aspects of fretwork. We have re-fretted & fret dressed countless instruments for players all over the country from our professional repair centre, & received many fantastic testimonials. We believe our fretwork service to be one of the best currently available. All our re-fretting & fret dress work is guaranteed (please see terms & conditions at bottom of page for details). As many guitarists are aware, the signs that your frets need attention can range from deep grooves or uneven loose frets that can cause buzzing & discomfort when fretting, to worn flattened frets that cause lack of sustain, choking of notes when bending strings & poor intonation (see below for more information). A lot of these symptoms develop gradually & are often isolated to certain areas of the neck. Whilst fret wear is an inevitable problem, its not unusual for players to adapt their style to accommodate these changes. The information included on this page should serve as a guide if you are considering any fretwork. Our most requested fretting procedures are listed below. Case studies can be viewed on our gallery page. Please contact us If you are considering any fret-work on your instrument. If via email please include your instrument make & model along with any fret preference size/type (if applicable). In certain cases of fret wear we may require photographs. Although guide prices are available on our pricing page, it is not always possible to give a set price on this type of work, please ask us for a no-obligation quote. Better still, pop into our repair centre where we can discuss your fretwork requirements in greater detail. For further information on costs please see our fretwork pricing article (lower down page). For most guitars with moderate fret wear, a correctly carried out fret dress can remove the normal associated signs of wear across the whole fret board or part of it, (partial fret dress) with minimal effect on fret heights. Often guitars may have their frets dressed 2 or 3 times over a period of time before needing a full or partial re-fret, however this will largely depend on the fret size & quality used by the manufacturer. Fret wear limits: As a guide, all fret tops must sit at least 0.9mm/.035″ above the fingerboard after the levelling/dressing of all grooves & problematic height variations, in order to maintain correct playability, any lower & you are in re-fret territory! Unless ultra low frets are your thing. Despite good condition & minimum fret wear, sometimes players just don’t like the feel of the frets on their instrument. For example, we have re-fretted fingerboards with little wear, for players who preferred either Jumbo or hardwearing Stainless Steel frets. Some of the most common fret related problems are listed below; many can & frequently do occur on new & older instruments alike. These are the signs of wear/damage we look for prior to instrument set-ups. Loose or uneven frets: Symptoms can include, varied degrees of buzzing on certain areas of the fretboard, loose fret ends that catch on fingers, uneven fret heights due to frets lifting out or being pushed in from impact damage, isolated areas of wear as a result of localised playing styles like open chords & 12th fret solo areas. Frets protruding past the board edge can be a sign of shrinkage in Rosewood & Ebony fret-boards caused by lack of moisture. General wear grooves: These tend to appear in the open chord areas near the nut & can be particularly noticeable on acoustic guitars. The symptoms can include buzzing notes, fretting discomfort & bad intonation. We often replace a few frets adjacent to the nut during fret dressing. Older & well played in guitars: Generally worn (including vintage) guitar necks can often suffer smooth low flattened frets; In extreme cases frets can be difficult to remove during re-fretting. Symptoms can include, fingers & strings dragging on the fret-board causing possible surface damage to the wood, poor intonation, notes choking when bending around the 12th fret area, particularly on guitars with low radius finger-boards. Changing the fret dimensions on any instrument will have an effect on other components & settings. Top-nuts often need replacing after a re-fret due to the original string slots sitting too low in relation to the new higher frets (tremolo type lock-nuts excluded). This is not the case after a fret dress & providing the nut isn’t damaged in any way, the slots shouldn’t need much attention. Fingerboard radius’s are often altered to personal preferences during a re-fret. Certain Fenders for example have a very tight radius curve; this is not to everyone’s taste & we frequently re-profile fingerboards to Jackson/Ibanez radius dimensions for example. All instruments will normally require a set-up after any fretwork to ensure optimum string action & playability are obtainable under normal tension conditions. Most players have a preferred fret type, as they do string gauge & brand. As lots of fretted instrument players will tell you, the profile, size & material of frets can have an effect on instrument tone! Choosing frets carefully on vintage instruments is essential & it’s worth doing some research before that re-fret rather than risk serious devaluation! Guitarlodge can advise on the important points to consider when having a re-fret, from the fret choice for your guitar & playing style, to the maintenance on your new fret job! Jumbo: (Tall with wide crown) these frets offer great feel & limited contact with the fingerboard. Improved sustain is a well-known benefit & they’re great for string bending. On the downside, Intonation will suffer as fret wear sets in due to wider flat contact areas & notes are easily sharpened when pushing too hard, especially if using lighter string gauges. That aside It’s no surprise that jumbos are now standard on many electric guitars/basses & our most frequently requested choice of fret. Narrow: (Various heights with narrow crown) these frets are mostly used on vintage guitars, Mandolins, Ukuleles & Banjos etc. Although they offer better intonation due the narrow contact area, they have a shorter lifespan & thinner tone. Many players dislike their feel & opt for jumbos. Low frets: (Very low with varied crown widths) many prefer the feel of ultra-low frets & often adapt there style accordingly. String bends are normally difficult due to excessive contact with the fingerboard. Bound fingerboards will always require the fret tang ends to be nipped off & prepared for correct installation. This process is sometimes necessary on certain unbound (hidden fret end) type fingerboards. Maple lacquered neck tops frequently require re-finishing. Usually down to wear marks or lifting of the finish during fret removal, which is normal. Its not uncommon for Rosewood/Ebony fingerboards to show signs of excessive wear & normally re-profiling using radius blocks can remove most wear marks. Occasionally these boards dry out & suffer serious splitting – replacement is sometimes necessary. Time consuming removal of frets due to previous bad fret jobs. This is a regular problem & re-fretting a poorly fretted neck is no fun! Frets are often super tight & hard to remove due to bad slot preparation, wrong size fret tangs or excessive amounts of glue for example. Your guarantee: We always guarantee our re-frets for a period of 6 months against premature wear, loose or uneven frets. This only applies to the work we have carried out & does not cover string breakages, damage due to misuse or rough handling etc. 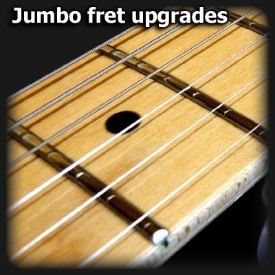 Fret dress work is covered under our guitar & bass set-up guarantee. Turnover time: With re-fretting you should always allow time-scales of 1 to 2 weeks. Sometimes this can increase pending unexpected extra work, availability of fret wire or other necessary parts. Allow 2 to 3 days for fret dressing. We will contact you if we are unable to meet an agreed turnover time.